When using the fine-tune feature. You cannot access a staging server that belongs to an untrusted domain. If a staging SQL server belongs to a trusted domain, only the SQL server authentication method is possible. 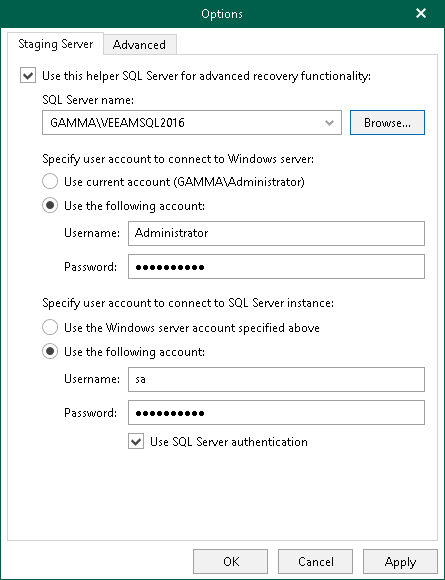 If both a staging SQL server and machine hosting Veeam Explorer belong to the same domain, then both Windows and SQL Server authentication methods are possible. In Active Directory Users and Computers, select a staging SQL Server. Open server's properties and go to the Delegation tab. Select Trust this computer for delegation to specified services only and Use any authentication protocol options for the cifs service on a computer with Veeam Explorer. Restart the staging SQL server. 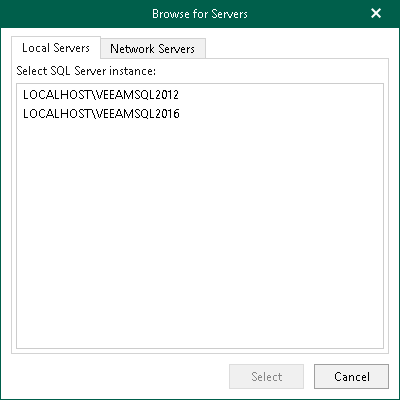 Select a domain user account you want to use when connecting to the staging SQL server, open its properties, go to the Account tab and make sure the Account is sensitive and cannot be delegated checkbox is not selected. Go to the SQL Server Settings tab. Specify a SQL server you want to use as a staging system. Click Browse to select a server, as described in Browsing For Servers. Specify the account to access the selected server. Specify the account to access a SQL server instance.